ZIMBABWE international striker Simba Sithole has re-joined Dynamos, after signing a one-year deal, and arrives just at the right time when the Glamour Boys’ campaign for honours has been stifled by a lack of goals from their strikers. Sithole is expected to start training with the champions this week. The striker has finalised a deal which will see him stay at the club, unless another South African team comes knocking on the door asking for his services, until December 2014. It’s his second homecoming at DeMbare after arriving at the Glamour Boys at a crucial stage last season and helping them to a League and Cup double. The striker scored six league goals and one goal in the Mbada Diamonds Cup when he joined the team last season and, with seven games to go this season, he is expected to play another big role as the Glamour Boys try to find the Midas Touch in the final home stretch of the marathon. DeMbare lead the race for the championship but only hold a one-point advantage over Highlanders, who picked a big point away in Mutare, thanks to a late own goal by Lloyd Katongomara, and the stage is being set for a blood-and-thunder showdown when the Glamour Boys visit Bosso in Bulawayo. Both teams are also still in the running in the Mbada Diamonds Cup. Interestingly, the forward joins Dynamos when they have seven matches still to play in the championship race, just as was the case when he arrived last year, and helped them power past the finishing line. 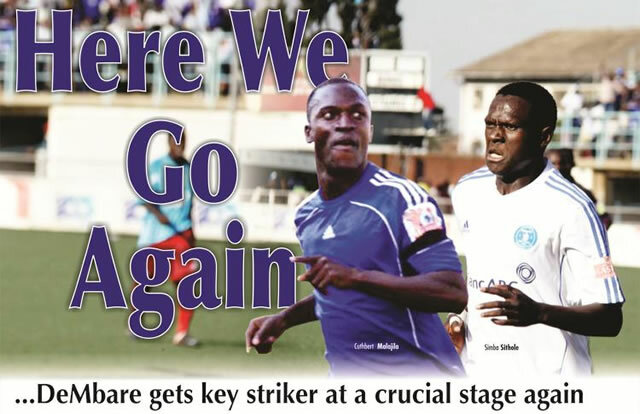 DeMbare’s strikeforce has been the team’s Achilles Heel and while Washington Pakamisa flourished at the beginning of the year, he has lost his touch and confidence and appears a different player as he struggles to cope with pressure. Pasuwa, who has patiently banked on him to find his range again, was forced to drop the forward in the match against Monomotapa but his replacement, Clive Kawinga, didn’t fare any better although he rattled the post. Yesterday, Dynamos revealed that they have forwarded the registration papers for Sithole to the Premier Soccer League. The Glamour Boys had remained with one slot when they added more players during the transfer window. They had anticipated to register former Ajax Cape Town midfielder Tafadzwa Rusike before the deal crumbled while defender Morris Kadzola remained registered with the club but his services were withdrawn by his parent club over a dispute. Sithole is coming in as a free agent and when registered would become the club’s 30th player. Yesterday, PSL chief executive Kenny Ndebele confirmed receipt of the papers from Dynamos but said they are yet to work on them. “The papers have been brought to us but we haven’t checked them as yet and we are also still to communicate with the club,” said Ndebele. Dynamos chairman Kenny Mubaiwa said they are now waiting for the league to process the registration of Sithole. “We have finalised the deal with Simba. His contract will expire in December 2014. So we are now waiting for the go-ahead from the PSL to use him,” said Mubaiwa. The player will have to be issued with the reverse international transfer clearance from the South African Football Association before he can kick the ball for the champions. But his management team yesterday said everything is on track. His manager Gibson Mahachi said his player was in excellent condition and ready to play his part for the club he helped win the league title last year. “We have agreed terms with Dynamos and we have signed a one-year deal. He hasn’t started training with the club and should start training this week. “He is hundred percent fit. But he cannot say anything at the moment and we believe he would rather start doing his talking on the pitch,” said Mahachi. Sithole left the club early this year for South African side SuperSport but the striker, who has been unfortunate with injuries, found it difficult to break into the team. A change in coaches did not help his situation as the gaffer who had signed him, Gavin Hunt, left to join Bidvest Wits while the incoming coach did not have him in his plans. The two parties then agreed to end their relationship, by mutual consent, with Sithole being given his free agency status once again. Sithole’s management team believes that the player can find the touch that made a difference, when he arrived at DeMbare last year, and convinced a respected coach like Hunt that he had what it takes to play for SuperSport United. Sithole’s return continues this interesting scenario where strikers arrive at the Glamour Boys, when they are going through a bad spell, and provide the magical touch that drives the team to the Promised land. In 2011, former Dynamos striker Cuthbert Malajila joined Dynamos in August, when the team was on third position behind then pacesetters FC Platinum and Motor Action, and the leaders had just fired Lloyd Mutasa after a poor run. FC Platinum and Motor Action had 40 points while Dynamos was a distant third with 33. But the former Chapungu and Highlanders hitman, who made his debut on the round 20 of Premiership action, the same day gaffer Callisto Pasuwa began his journey, scored that afternoon in that 4-1 drubbing of Shooting Stars. Malajila went on to score three more goals in the same month he joined DeMbare from Libya, he was recalled into the national team by the then coach Norman Mapeza. The striker combined well and assisted Rodreck Mutuma, who won the Golden Boot that year, find his touch once again after a dry spell. Mutuma later acknowledged that the arrival of Malajila was the turning point in his season, at a time when he was beginning to doubt himself, and it was crucial in firing DeMbare to league championship honours. Some analysts also feel that Mutasa could have succeeded at DeMbare had Malajila arrived earlier and played for him. And then last year, in the final third of the Premiership campaign, Sithole joined the club and went on to contribute some important goals. Former Dynamos striker Takesure Chinyama, who had started the season scoring for fun for DeMbare, had left the club around July. But two months later his void was filled. The former Pamushana High student joined Dynamos when they were on the top of the log, two points better than second-placed Highlanders. He quickly settled at the club and formed a deadly partnership with the likes of Denver Mukamba and Mutuma and by end of season, he had his first League and Cup medals. A revived Sithole did not wait to play in the Champions League but joined the great trek to South Africa again.